1. Preheat the oven to 140°C, gas mark 1; line a large baking tray with parchment. Using electric beaters, whisk the egg whites in a bowl with a pinch of salt and a few drops of lemon juice to stiff peaks. Scatter over 3 tbsp sugar and beat until stiff and glossy, then beat in the remaining sugar 3 tbsp at a time. 2. Very lightly swirl the melted chocolate through the meringue until just marbled, then spoon 6 equal heaped circles onto the baking parchment. Using the back of a spoon, make a deep well in the centre of each meringue. Bake for 1 hour, then turn off the oven, open the door a little and allow to cool for 1 hour. 3. Gently stir the icing sugar and vanilla into the cream (whisking it gently to soft peaks if necessary). 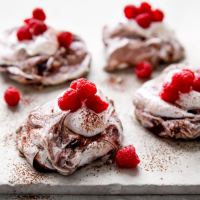 Spoon onto the cooled meringues, then scatter over the raspberries. Dust with cocoa to serve. Adding the lemon juice and salt to the egg whites helps to stabilise them before whisking.